Google looks a lot ambitious on Google+ project. Every day it is adding a new feature on Google+. The social networking facet of Google has already crossed 20 million active members. Google+ attracts users from other popular social networking sites including Facebook and Twitter. To attract new users, Google is refining the features offered through Google+. Google+ venture is culmination of removal of drawbacks in Facebook and addition of some unique and new features. Google+ likes to take advantage of all the privacy and security lag behinds of Facebook. It would like to enhance the social networking platform with new features like circles and hangouts. Games, music and video albums can be enjoyed and shared in a better way. The refined chat services from Google+ is intended to give you more control on who you can chat with. Form now onwards, you must send an invitation to your friend so that he will appear in your chat list. As of now, you will be available in Google+ chat service automatically if your friend is in your circles. This new dimension provides you more control with regards to whom you want to add in your chat list. However, the new change will not apply to Gmail, Orkut and iGoogle users. You will be able to chat with your contacts in Gmail as usual. When you login to your Gmail account, the contact list will be populated on the left hand side in a pane. You can sign in and sign out of your chat service. When you are signed into the chat service, you will be notified with green icon on the left hand side of your name. In the same window, if you are able to find any of your contacts with a green icon, you can understand that the person is available for chat. You can initiate chat by clicking on the contact. 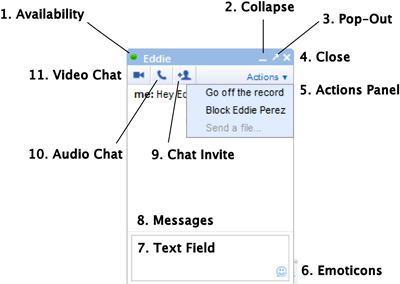 By using GTalk software you will be able to talk separately in a big window. This facilitates you talk continuously even if you sign out of your Gmail account. Gtalk is a software like Yahoo messenger and you can talk independently with other Gmail users. You can login and logout using the same email id that you use for Google+ and Gmail. As of now, there is no change in the chat rules with Gmail and GTalk. All of your contacts will be populated automatically in your chat window. You can find friends available for chat in the chat roaster located at the bottom right hand corner of Orkut. If the chat window is minimized you can click on ‘online friends’ to maximize the window. The window displays the list of contacts made through Gmail, orkut and iGoogle. You can chat with your friend by just clicking on the name. If the person you want to chat is not present in the list, you can search for the same in the search box and that name can be added to your chat list. You can send invitation to your friend to initiate a new chat. Your chat status will be notified through the bubble on the left side of your name. A green color bubble notifies that you are ready for chat and red bubble notifies that you are busy and yellow colored bubble notifies that you are away from the system. As long as you are logged in to orkut, you will be able to chat. As of now, there is no change in the way you chat on orkut window. Google offers maximum flexibility to chat with your Google mail id holders. iGoogle is one of such features. iGoogle is your Google’s homepage that can be customized as per your requirements. You can set the homepage with the news, games, videos and other useful content that you visit quite often. iGoogle offers browser based chatting just like Gmail based chatting. You will be able to chat with friends that are logged to either iGoogle or Gmail or GTalk. Just click on the chat and you will be able to exchange messages with your friends who are online. There is no change in the chat rules of iGoogle. When you are inviting contacts for chat on Google+, you will be identified with your email address along with your name. Google is working hard to conceal your email id when you invite your contacts for chat. We may expect this feature in the next phase! Jane also writes for YouLoveCoupons, a discount coupon site that features carbonite and sittercity coupons among the others. She wishes to share a couple of them with you: carbonite offer codes, sittercity voucher. If there is one thing that Google+ has on Facebook, that is chat quality. Facebook has done such a poor job on their chat and now they are only getting it to be more and more confusing. At the same time, Google+ even gives you a chance to make group video calls. I mean…it’s not hard to say who does it better.